Jamey Johnston – Bits about Bytes and Light! In 2012 the company I work for made a shift to adopt more of the Microsoft data technologies going forward. So, six years ago, I attended my first PASS Summit in Seattle in November 2012. In less than 2 months I will attend my seventh PASS Summit. Why, because it is the best technology community I have seen out there. Don’t get me wrong I made some great friends in other tech communities and learned a great deal. However, the #SQLFamily, as it is called in the PASS community on Twitter, is a great one. My first memorable encounter with the #SQLFamily was my first day at PASS Summit in 2012. It was a Pre-Con day and I was with my co-worker and friend at lunch. We were looking for a table to sit at and when we found a table I met my first three friends in the PASS Community, Cher (t), Melissa and Jeremy (t). I still hang out with them at various PASS events like SQL Saturdays and PASS Summit and we still joke about how Melissa said that I had to go get her lunch if I wanted to sit at the table (which I did, salmon, I think!). In 2012, I learned that the sessions at #PASSSummit were presented by individuals who were extremely talented, personable and they were able to take deep technical topics and present them in an easy to understand manner. I was hooked on making PASS Summit a part of my yearly conference schedule. In 2013, PASS Summit was in Charlotte, NC, and I learned for the first time about the Microsoft MVP program and made my first MVP friend, Jason Horner (t). Jason was instrumental in coaching me over the next 4 years on how to give back to the Microsoft community and become a Microsoft MVP. Jason really became the guy that inspired me to become an MVP, not for the nostalgia of being an MVP but for the reward that comes from giving back to the community. I didn’t know in 2013 that I wanted to work hard to become a MVP, but I met so many awesome people that were MVPs that over the next few years I wanted to be one of them and give back. I met some other great friends in 2013 that I see often at SQL Saturdays and PASS Summit, Mickey (t), Martin (t), Cathrine (t), Maria (t) and Bob (t). Over that next few years I added to my list of PASS friends, Wendy (t), David (t), Chris (t), Amy (t), Wolf (t), Naomi (t), John (t) – nominated me for MVP!, Reeves (t) – <3 you!, Ginger (t), Alan (t), Nancy (t), Joe (t), Rebecca and Devon (t) – the last 5 I have co-organized SQL Saturday Houston the last few years. I have met many others too (Angela, Lance, William, Rie, John, Karla, Mindy, Brandon, Tamera, Tim F., Stacia and so many more … I really could type 100 or more names …)! Fast forward a couple of years to PASS Summit 2015 and my first time to speak at PASS Summit. I was invited by Microsoft to speak on the new Security Features in SQL Server 2016. It was such a rush and the real start of my involvement as a PASS Community Speaker which was crucial in me getting awarded a MS Data Platform MVP. I have spoken over the last three years at 3 PASS Summits, 30 or so SQL Saturdays, several Universities and other conferences including my first international conference in London earlier this year. It has been a great journey to become a Microsoft Data Platform MVP that started in 2012 at PASS Summit! Truly, though, the best thing to come out of my attendance of PASS Summit is the lifelong friendships I have gained that have helped me to become a better person and data professional. I encourage you to attend PASS Summit and meet new people and learn new data skills. I, also, challenge you to give back and maybe one day speak at PASS Summit and who knows become a Microsoft MVP! As you can see this is simple code and works like a charm! Hope you enjoy and hit me up on Twitter (@STATCowboy) if you have questions or improvements to the T-SQL Code! This is Part 3 (the final post!) of a 3-part Blog series on my Career Journey the Last 20+ years into my current role as a Data Scientist. Part 1 can be found here and Part 2 can be found here! BI is fun! I loved it and soon was not missing the late-night pages of down databases or late nights doing database upgrades. (Although, one night I upgraded 11 Oracle production databases to Oracle 11g at the same time which I must admit was fun!) I loved the insights I gained from building BI solutions using MS products like SSAS, SSRS, MSSQL and SharePoint. 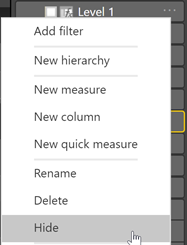 I also loved the new-found freedom of exploring data and making it all work together in tools like Spotfire and Power BI! I was building large analytic datasets with billions of rows and special analytic calculations. I was having fun but I was missing something to truly fill the gap as a data scientist, statistics! I was driving late one night into the office on I-45 in Houston which was not my normal route and I see this billboard for Texas A&M Masters of Science in Analytics! I had been looking for a program to learn statistics but I wanted it local (my ADHD doesn’t do well with online classes!). This was March of 2014. I was accepted into the program in June 2014 and started classes the end of August 2014! To say the least, the next two years my life was crazy! I had started to learn R the last year or so and in the program, I learned about SAS and SAS JMP and a ton of statistics from regression, time series, spatial statistics, multivariate analysis to machine learning! I was having a blast learning statistics and all my friends and family thought I was plum mad to start grad school in my 40s and in all things, Statistics! I can’t emphasize the importance of a good education in statistics and how valuable the MS in Analytics from TAMU was in that education. 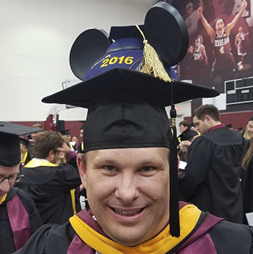 I graduated in May 2016 with my Masters and could not be happier with my experience at TAMU. I am proud to be a member of the Fightin’ Texas Aggie Class of 2016! 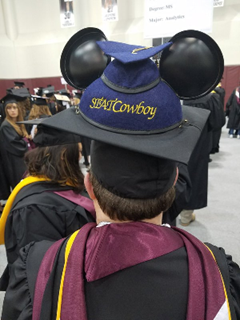 Yes, I wore Mickey Ears with my Twitter handle (@STATCowboy) on the back at graduation! Armed with my learning of R, SAS and more importantly, Statistics, I am fully ready for whatever data is thrown at me. I get to build some really cool statistical and machine learning models these days and I can’t believe at 42 years of age I have a new career I basically started at 40! I guess if you are going to have a midlife crisis a career change to The Sexiest Job of the 21st Century according to the Harvard Business Review is a good crisis! Who knows what career I will have at 50?! I’ll finish with my definition of a Data Scientist – someone who loves finding insight from data, big or small! In some ways, we are all data scientist and I would encourage anyone who would like to take their data knowledge to the next level to learn Statistics. Statistics is the first leg of a three-legged stool that makes up data science. The second leg is a data guru! Someone who can store, move and manage data and present it in an easy to use fashion that can be consumed quickly. The final and third leg of the stool is a Subject Matter Expert (SME) who knows the business and the data around the business. One person is never an expert in all of these but a Data Scientist is typically an expert in one and very proficient in the others. However, I find the best Data Scientist is really a team of folks that love data and bring expertise in one of the three areas – statistics, data or subject matter expert – to the table to build models to make business better! To get you started in your career as a Data Scientist check out my presentation from SQL Summit 2016 here. 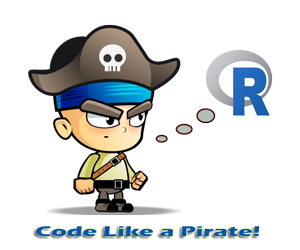 Be sure to check out the resources section of the PPT to see some good locations to learn things like R! Also, feel free to reach out to me on Twitter if you have questions along your journey. I am happy to help! I hope you enjoyed reading about my journey. I know have enjoyed living it! So, you want to code like a Pirate! – R … R … R! Thanks for all who attended my session at SQL Pass Summit 2016. The link to the scripts, documents and presentation materials from the session is below. If you have any questions or comments, feel free to hit me up on Twitter (@STATCowboy). I really appreciate all of you who attended and sorry if I got to statistically on you! This is Part 2 of a 3-part Blog series on my Career Journey the Last 20+ years into my current role as a Data Scientist. Part 1 can be found here! I had been working for LDEQ for three years now and was one year removed from college when a good friend called. He was working as a consultant for Oracle Corporation in Houston. Oracle had signed a big contract with a client in Houston and needed DBAs on the project. He told me to send my resume so I could join him which I did! Two weeks later I was a Senior Consultant with Oracle Corporation working and living in Houston. It was a very exciting time of my life those three years. I had one of the best DBA mentors you could have, Clement C., teaching me about Oracle and technology and was getting to travel to some cool places in the US. Most importantly, though, I found the love of my life soon after moving to Houston, my wife, Melanie! Oracle was a great 3 years for me and I learned so much that truly set the stage for the next 10 years or so of my life as a DBA. I enjoyed Oracle but after 3 years of travelling it was time to stop traveling and get a local job in Houston so I could spend more time with my wife and dogs! My wife will tell you I only stopped traveling for the dogs (not true though)! This little-known company at the time called Enron (Ha Ha!) was hiring and I got hired on there! It was June of 2001 and Enron couldn’t be flying any higher (at least in their make-believe world!). We were one of the 10 largest companies (at least on invisible paper) in the world and the talent coming to work there was second to none. Over the next year and half I would learn a great deal about business as well as management as I was soon promoted to manage one of the core DBA teams at Enron. Enron went bankrupt and I moved to work for UBS when they bought the North American trading division of Enron. After a brief stent at UBS they decided to get out of Houston and I went to work for a small consulting firm, Methods Technology Solutions, out of Baton Rouge. I did some travelling again and really had a lot of freedom to learn some new things and work on a variety of database projects from very small projects to bigger ones. I worked for Methods for 4 years, the last year and half consulting at a large independent Oil and Gas company. The Oil and Gas company offered me a full-time employment job and I have been there now for over 12 years. The first 7 years at the O&G company I was a DBA team member working on admin, upgrades and a lot of tuning. It was fun! I had some time to write a little code, too! I created an end-user web dashboard for the app owners to see what was happening in the DB with their systems in C# ASP.NET. I created a multi-threaded application in C# to rapidly put together archived emails in to a bundle and create audit trails in XML, CSV, TXT and DB tables. However, I mostly did the typical enterprise DBA tasks. I really enjoyed tuning database systems. I was a master of 10046 traces in Oracle and SQL Profiler and Extended Events in SQL Server and was able to tune a great deal of our applications. The funny thing about tuning databases when you are a DBA is you tend to look for that magic parameter, trace flag, bad SQL, etc. and often forget about the application and business processes behind what you are trying to optimize. More importantly, you often forget about the business people using those applications and how that data is used to add business value. Anyone who knows me knows I am not shy! I love people and I love engaging with people. This led me to have a different approach to tuning. When I would get a call that something was slow I would find the business person who was having an issue, schedule an hour of their time in their office, have them reproduce the issue in the system while I watch both what they were doing in the application and also what was happening in the database. It was funny to see their face when the “DBA” would show up in their office. It was like an endangered species had left their native habitat and ended up in their office. Many would even tell me I have never seen a DBA before! This approach created a special relationship that allowed me to start understanding the business processes behind my company and fostering relationships to do more than just “tune database systems”. I was put on a special project to implement a new business system and was actually placed for a year within the business team to assist with implementing the application. The application is a critical one for O&G companies and so I was dedicated to just working on that project and application. For the first time in almost 15 years I wasn’t a DBA! I wasn’t on-call (I didn’t know what to do with my new-found freedom). I didn’t have to do database upgrades. It was so weird to actually be a “customer” of the DBA team! It certainly gave me insight into how it felt to be on the other side of the table. I absolutely loved the project. I spent so much time understanding all the various data pieces and how they would flow into the new system (we had several different DBs that would need to integrate into this new system) and more importantly how that data truly worked for this particular part of the business. I really loved data! I realized then that I didn’t really want to be a DBA full-time (still like the part-time idea just to keep current but not very practical) but I wanted to work with data. I wanted to build datasets and analyze them. I wanted to find ways to better connect them together. I wasn’t quite on the statistics track yet but definitely the data and business side of Data Science. As I began to understand the applications and business processes behind using the databases I supported, I also became aware of how so many of the systems were connected to one another either by ETL, database links, linked servers or virtually through various business processes. The connections of all the systems and more importantly, for me, the data led me on my next journey into BI. I had become exposed to a tool called Spotfire while I was on the special project and learned how to use the tool and how people at work were using the tool. So, I began to work on connecting Spotfire directly and securely to the data sources and soon I was moved onto the BI team working on BI projects in Microsoft and Spotfire. I was a BI guy now! Stayed tuned for Part 3 tomorrow – BI to Data Scientist! So I am at the EMP in Seattle attending the SQL Summit 2015 Appreciation Event and I am introduced to Denise McInerny (t) by my good friend Wendy Pastrick (t | b). Of course, the common pleasantries are exchanged, “My name is …”, “I work at XYZ company …” and “I do ABC job …”, which in my case is “My name is Jamey Johnston, I work at an O&G company and I am a Data Scientist”. Denise’s response was not quite what most people’s response is when I tell them I am a Data Scientist. Usually I get a general look of trepidation or the occasional, “Oh, you are an unicorn!” (true story, several times), but in Denise’s case she says “You should write a blog about your journey to become a Data Scientist” (or something along those lines). I thought that might be a fun blog to write and said “Sure!”. So here is the story of my journey to becoming a Data Scientist. The next thing I see is the greatest thing I have ever seen – “My Name is Jamey” scrolling across my parent’s TV screen as fast as I can read it! I sit there and watch it go across the screen over and over and over again finally asking myself – “How do I stop it!?”. I scan through the manual that came with the Vic-20 looking for the correct key combination to stop it! No Luck and no Internet in 1982 so I do the only thing I can think of to stop it – “Unplug!”. I loved that computer and it was what fueled my desire to learn more about computers! Fast forward to college and I am a 19-year-old who just finished his first year of college as a Psych major and I get a job with the Civil Engineering department at school working with GIS and Remote Sensing technologies. My father had started in GIS and Remote Sensing back in the 70’s for Wetlands research working for the Department of Interior so I was familiar with GIS and Remote Sensing and I was excited to work with big workstations, lots of data and getting to work in the same field as my dad! So these big workstations were SGI and DG boxes running from 25Mhz to 100Mhz processors! Your phone is probably 100 times faster! Two years later I finish my junior year and I am still working on GIS and Remote Sensing projects, one of which was to run clusters against tiles of Thematic Mapper satellite data of the entire state of Louisiana and then use those clusters to classify them into land use and land cover categories (i.e. is this cluster water or agriculture or coniferous forest, etc.). I was working with ESRI and Erdas Imagine software and learning UNIX which was really fun and beneficial to my career. I loved being a GIS and Remote Sensing technologist but I was still a Psych major! I wanted to change majors but the problem was my University only had ONE geography class! So there was no way I could stay at the University of Southwestern Louisiana and get a GIS degree. I transferred to LSU to start in the Fall of 1995 which had a great GIS program through the Department of Geography and Anthropology to get a BS in Geography with an emphasis in GIS and Remote Sensing. I also went to work for the GIS Center at the Louisiana Department of Environmental Quality (LDEQ) continuing my career in GIS and Remote Sensing. It took me two more years to finish school as I had to take 36 hours of Geography to graduate. My first semester was 12 hours of Geography with a Geography 1001 class up to a Graduate level class of Geography 4998 and a music class I believe. It was a fun semester to say the least. I graduated in Spring of 1997 from LSU and continued working for the GIS Center in the field of GIS and Remote Sensing. I also started working with another cool technology, Relational Database Management System (RDBMS). ESRI had created the first version of ArcSDE which was a way to store your spatial data in a database. In my case it was Oracle. We had Oracle v6 and v7 databases at LDEQ and I was starting to learn them to support ArcSDE along with some other technologies that required RDBMS. Stayed tuned for Part 2 tomorrow – DBA to BI! So you want to code like a Pirate! – R! Thanks for all who attended my session at SQL Saturday Albuquerque (#SQLSatAlbuquerque). Below is the link to the scripts, documents and presentation materials from the session. If you have any questions or comments, feel free to hit me up on Twitter (@STATCowboy). 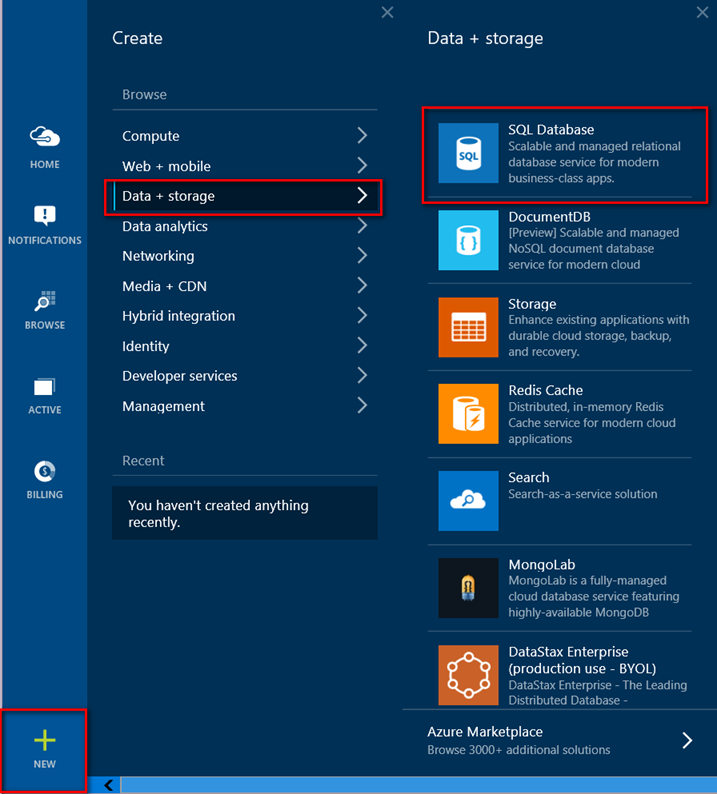 NOTE: Demo requires SQL Server 2016 CTP 2.4+ or Azure SQL Database v12. 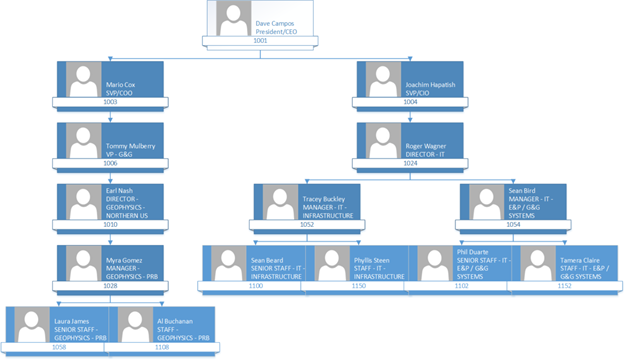 This first part of the demo is meant to show how an organizational hierarchy and asset hierarchy can be leveraged together to provide Row Level Security on tables in a SQL Server database using the new predicate based RLS feature in SQL Server 2016 and Azure v12. This demo is completely made up oil well production data for a fictitious organization with 153 fictional employees and come as in with ABSOLUTELY NO WARRANTY or GUARANTEE! Also, the demo will show how to use RLS with the HieararchyID Datatype, the new Dynamic Data Masking and Always Encrypted Security Features. This post is about the demo which will show you an advanced implementation template for RLS as well as some of the other security features. Please use the links above to the official Microsoft documentation to learn about each feature first before trying out the demo as it will help you understand the demo better. 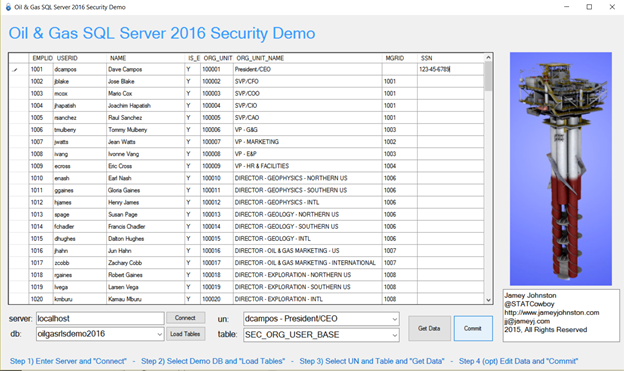 If you attended the session at SQL Summit 2015, Overview of Security Investments in SQL Server 2016 and Azure SQL Database [DBA-327-M], which I co-presented with the Microsoft SQL Server Security team this is the demo we used at the end. 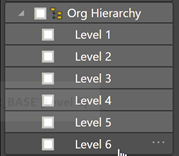 The basis of the security is nodes in the organizational hierarchy are granted access to levels in the asset hierarchy and those grants filter down to the members below in the hierarchy. 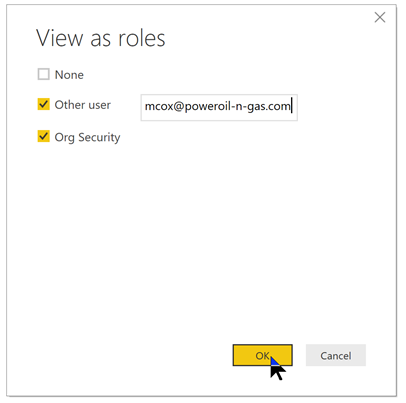 This allows for inheritance of permissions via the Organization and Asset Hierarchy (i.e. Child nodes can inherit from Parent Nodes). Functionality is built-in to the model to override the security model for a lower member including denying access altogether (‘NONE’ in the security map) or granting access to all data (‘ALL’ in the security map) via exceptions (SEC_USER_EXCEPTIONS). 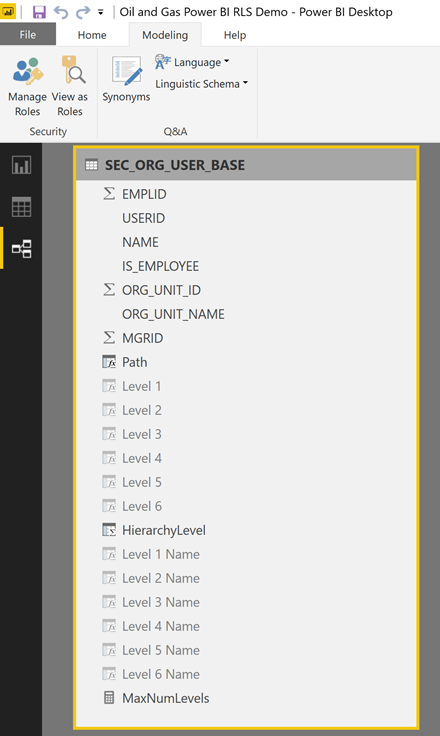 A base user table exists (SEC_ORG_USER_BASE) that has the relationship of employee to manager as well as the organizational unit id for the employee. This table would likely be fed from an HR system in a production scenario. 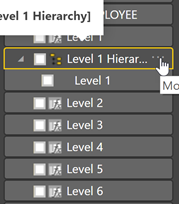 A master table for the wells (WELL_MASTER) contains the asset hierarchy to filter security to the well data. Read the notes about the tables below for more details. 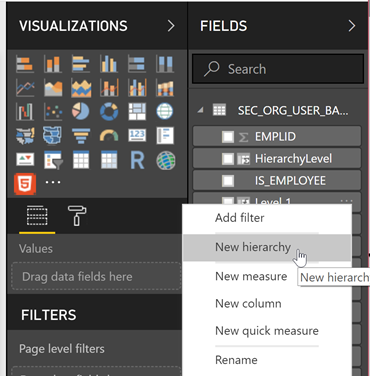 Below shows what an Asset and Organizational Hierarchy would look like (also, this is what is in the demo) and finally a walk down one branch of the organizational hierarchy to see how to apply RLS against the Asset Hierarchy. SEC_ORG_USER_BASE_HID – Same as SEC_ORG_USER_BASE but includes HierarchyID column to demonstrate RLS with HierarchyID data types and to demonstrate Data Masking. 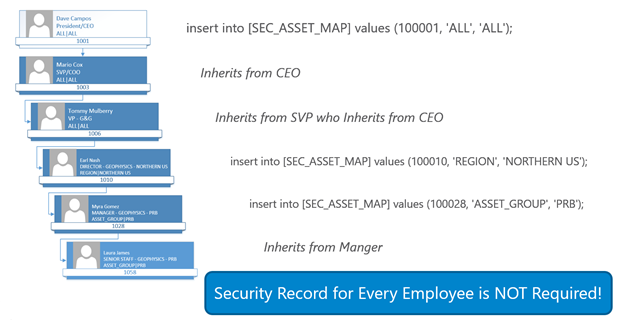 SEC_ORG_USER_BASE_MAP – Table contains the employee data including an entry (SECURITY_CLEARANCE) to denote the security clearance the employee is granted by walking down the organization hierarchy and finding the lowest level above including themselves that has been granted access to data. 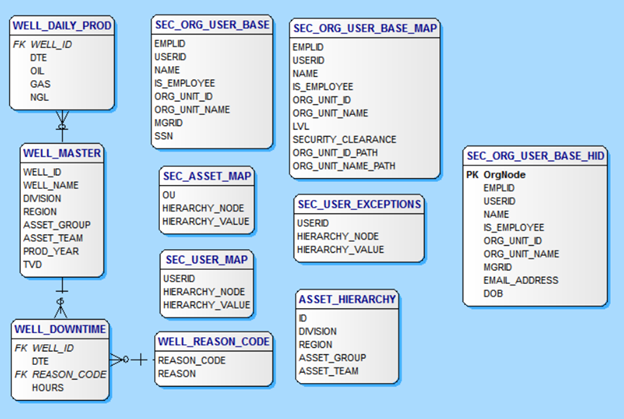 The SEC_ASSET_MAP table is used along with the SEC_ORG_USER_BASE table to generate the data in this table. The procedure REFRESH_SECURITY_TABLES is called to refresh the data in this table. SEC_USER_MAP – This table is generated by the REFRESH_SECURITY_TABLES procedure and generates the asset level access for each user in the database based upon the values in the security tables SEC_ORG_USER_BASE_MAP, SEC_ASSET_MAP and SEC_USER_EXCEPTIONS. This is the ONLY table used by the functions for the Security Policy. 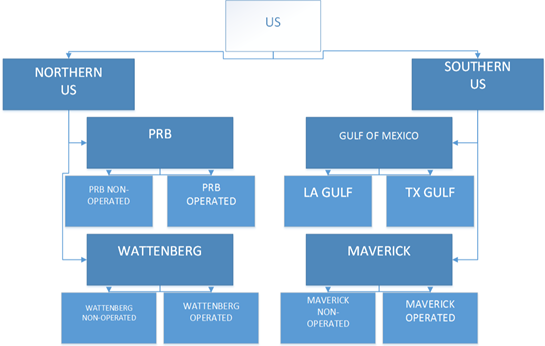 The other SEC_ tables are used to generate this table for RLS. This script sets up the RLS functions, policies and the procedure REFRESH_SECURITY_TABLES. The procedure REFRESH_SECURITY_TABLES is used to generate the RLS security mappings in the SEC_ tables as described in the sections above. In a production environment this procedure would need to be run every time the hierarchies were updated or new users were added to the database. This script also will build users in the database based on the userids generated in SEC_ORG_USER_BASE table for testing RLS. 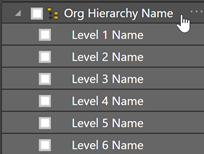 This script contains sample queries to test RLS at different levels in the organizational hierarchy and asset hierarchy. It also will add another entry in the security table granting a user access to another level in the hierarchy along with their current level and run the procedure to update the security to include this new entry. This script makes a copy of the SEC_ORG_USER_BASE table called SEC_ORG_USER_BASE_HID that contains a version of the Organizational Hierarchy using the HierarchyID Datatype. 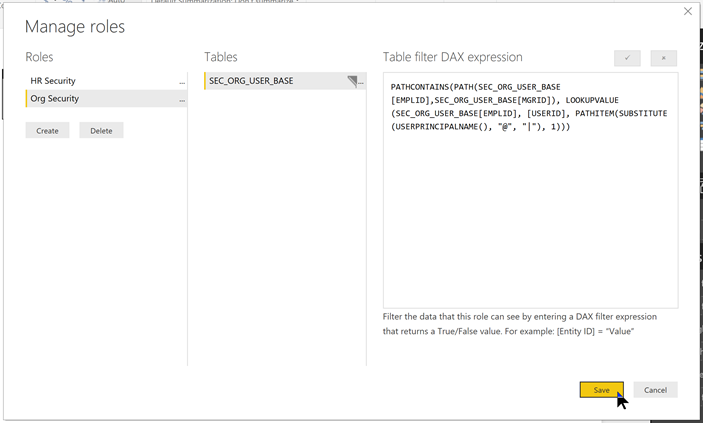 It shows how to populate a HierarchyID Datatype from a Parent/Child Hierarchy and will implement RLS security using the HierarchyID Datatype as well as add some new columns, EMAIL_ADDRESS and DOB (Date of Birth) to the table to highlight Dynamic Data Masking in SQL Server 2016. This script will setup the Master and Column keys for Always Encrypted as well as add a new encrypted column, SSN, to the SEC_ORG_USER_BASE table to test Always On Encryption. NOTE: If your database you are using for this demo is on a separate server than where you will run the application (see below) included in the download to test all the features you will need to run this script from SSMS on the machine you run the application and it will need .NET 4.6. There is an application built in Visual Studio 2015 (.NET 4.6) that you can use to test out the demo once you run all 6 scripts (Source code is included as well!). Just run the EXE in the download on a machine with .NET 4.6 installed and the instructions are at the bottom of the application (see screenshot below). Use the WELL_MASTER, WELL_DAILY_PROD and/or WELL_DOWNTIME to test the Parent/Child RLS Demo (Scripts 1 – 4). Use the SEC_ORG_USER_BASE_HID table to test the RLS with HierarchyID and Dynamic Data Masking (Script 5). Finally, use the SEC_ORG_USER_BASE table to test the Always Encrypted. You can EDIT the fields by clicking inside of them so for the Always Encrypted Demo you would click in the cell for SSN for an employee and enter a valid SSN and click “Commit” (see screenshot below). Run all the scripts in the MSSQL 2016 folder in order, 1-6, on SQL Server 2016 CTP 2.4+ or Azure SQL Database v12. Hope you enjoy and tweet me @STATCowboy if you have questions, comments or concerns or need help with the demo! Azure SQL Database is a relational database-as-a-service that allows for scaling up to thousands databases. It is a self-managed service that allows for near-zero maintenance, in other words, Microsoft handles all the backups, patching and redundancy. 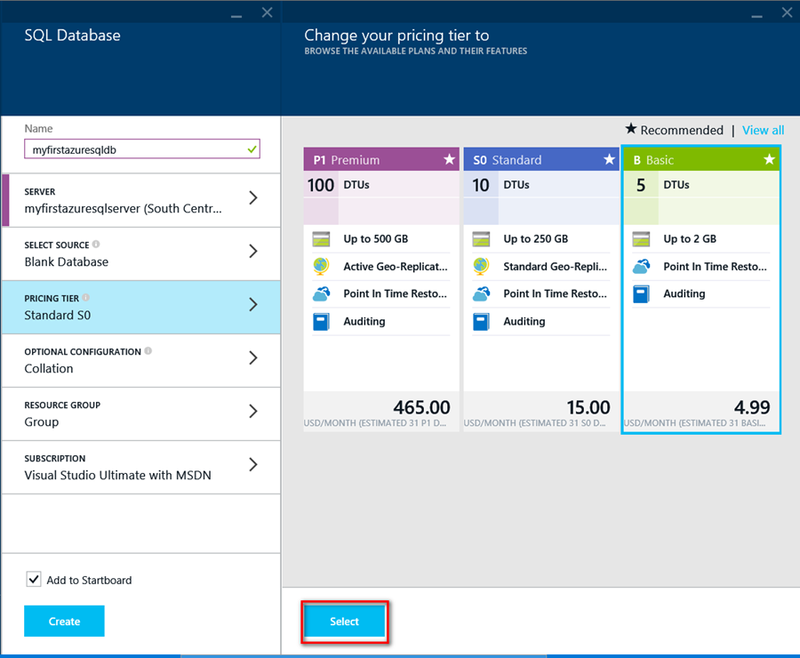 Azure SQL Database offers service tiers that allows for dialing up or down the horsepower as needed which also means the pricing can scale up or down. Pricing of the Service Tiers range from ~ $5/month to the slowest and smallest in size to ~$3,270/month for the fastest and largest. 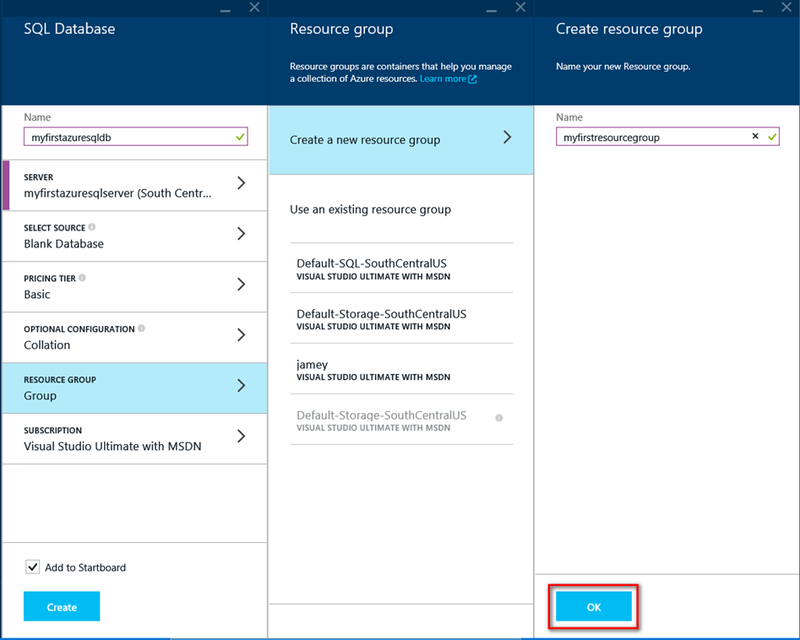 In this post we will walk through the steps to create an Azure SQL Database using the new Azure Portal. Please note the new Portal is still in beta so the steps and screenshots may change as Microsoft still rolls out the new portal. 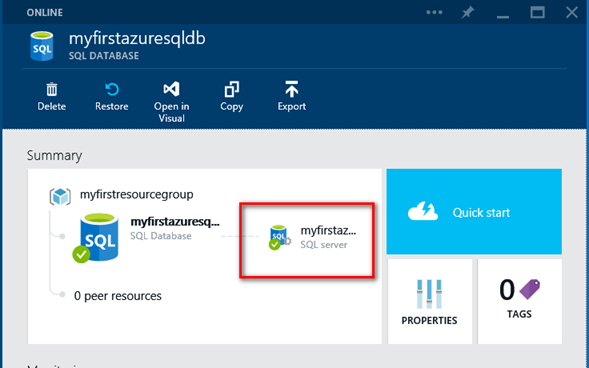 This post is based on the documentation on Azure, Get started with SQL Database by jeffgoll, which shows how to setup an Azure SQL Database using the older Azure Portal. 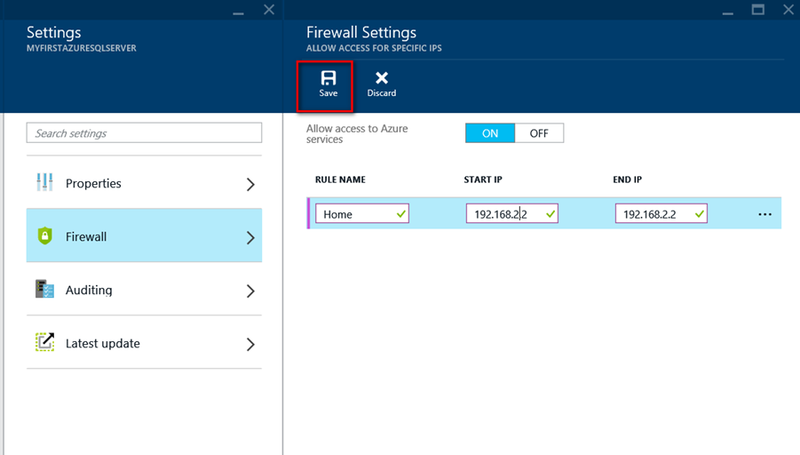 This step can be skipped if you already have an account on Azure. If not, go to http://azure.microsoft.com and click on the “Free Trial” in the upper right corner to get started. 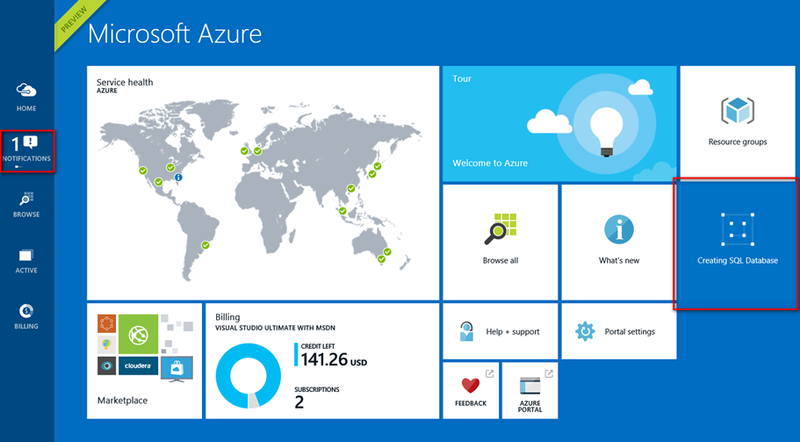 Access the new Azure portal at http://portal.azure.com and login with your Azure Account. Click “New” at the bottom left of the page, then “Data + Storage”, then “SQL Database” to start the SQL Database wizard. 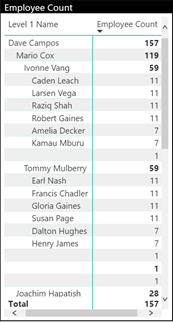 In the “SQL Database” panel enter your desired Azure SQL Database name in the “Name” field (e.g. 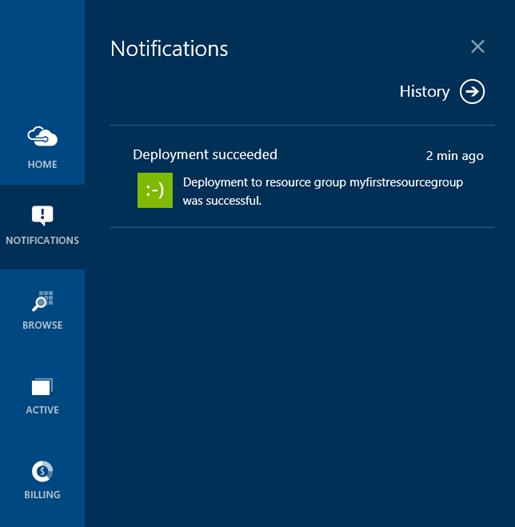 myfirstazuresqldb) then click “Server / Configure required settings“. 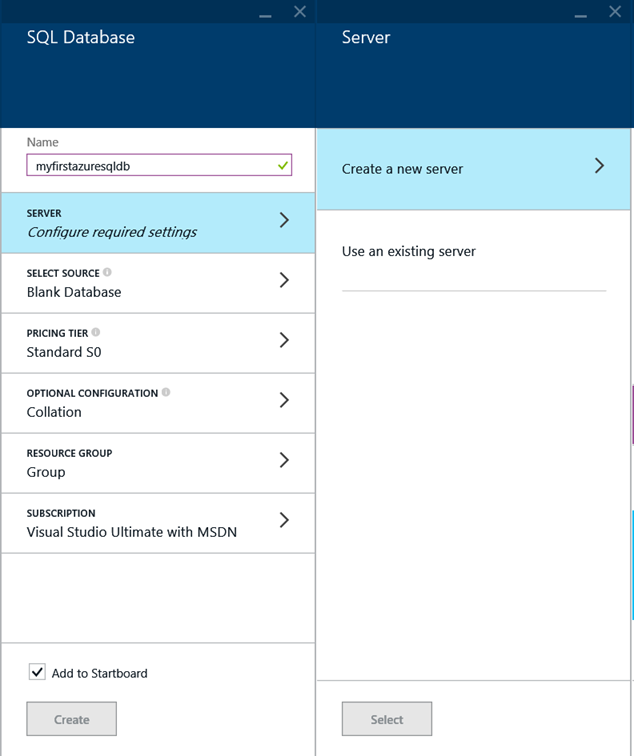 In the Server Panel pop-out to the side, click “Create a new server” (I am assuming if you are reading this tutorial you don’t have an existing Azure SQL Server setup!). 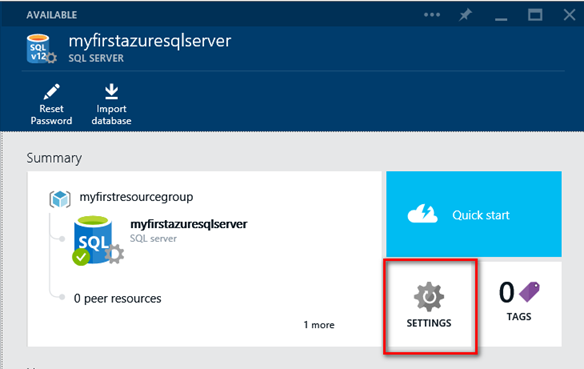 In the “New Server” panel pop-out enter an Azure SQL Server name in the “SERVER NAME” field (e.g. myfirstazuresqlserver), a Server Admin Login account name in the “SERVER ADMIN LOGIN” field (e.g. SQLAdmin), a password in the “PASSWORD” field and enter the password again in the “CONFIRM PASSWORD” field. Choose the location where you want the server to reside by clicking in the “LOCATION” area and choosing the Location. Leave the “Yes” chosen in the “CREATE V12 SERVER (LATEST UPDATE) so we can learn some new features in a later blog post. Leave “ALLOW AZURE SERVICES TO ACCESS SERVER” checked. Click “OK” at the bottom of the “New Server” panel to continue. Back on the “SQL Database” panel leave “Blank Database” selected in “SELECT SOURCE” option and click on the “PRICING TIER” option and choose “B Basic” in the Pricing Tier panel pop-up and click “Select” at the bottom. 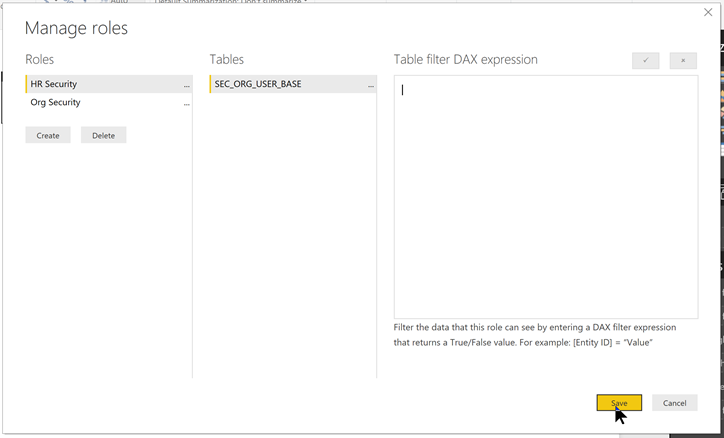 On the “SQL Database” panel you can set the desired Collation but we will leave it the default for now. Click on “Resource Group”, then in the “Resource Group” panel choose “Create a new resource group” and then in the “Create resource group” panel type a resource group name in the “Name” field (e.g. myfirstresourcegroup”). The page will go back to the Portal front page and a tile will appear with the title “Creating SQL Database”. Also, in the side bar to the left you will see a notification. 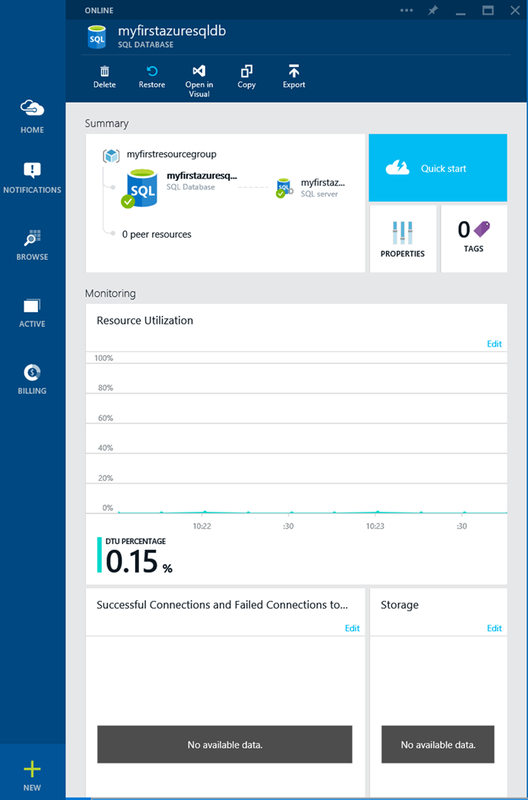 Once the database is provisioned the pages will refresh and show the Azure SQL Database Dashboard page. 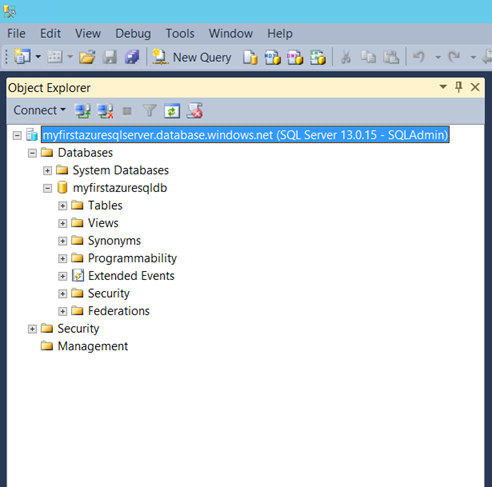 Click on the Azure SQL Server under the “Summary” section. The “SQL Server” panel will pop-out to the right, click “Settings” to open up the SQL Server configuration panel to the right. In the “Settings” panel click on “Firewall”. In the “Firewall Settings” panel that pops-out enter a “RULE NAME” (e.g. Home), the START IP and END IP which will probably be the same IP address if testing from home. You can use a website like whatismyip.com to get your external IP address. 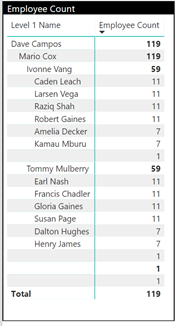 Click “Save” at the top once finished entering the values. (NOTE: The values below are not valid and you should enter the correct ones for your location). A message should appear indicating the firewall rules were successfully updated. Click “Ok”. Finally to test your new Azure SQL Database download the SQL Server 2014 Management Studio Express and install using the defaults. Choose the 32-bit or 64-bit version depending on your O/S version (probably 64-bit for most). 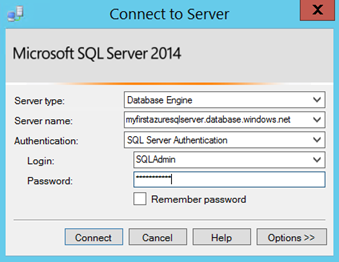 Launch SQL Server 2014 Management Studio from your PC and login to the server you created in Step 2 using the server name, admin account and password and click “Connect”. Congratulations you have created your first Azure SQL Database!